Search engine optimization is the work put into making a website the most valuable in a specific search. SEO is about attracting and capturing the most convertible lead - these come through organic search. This means a user has a problem, searches for a solution online, and finds their answer in the highest ranked and most relevant website. Our SEO work strives to put CCMC at the top of relevant, high volume searches. Conversion rates on organic search often are double and triple that of direct and referral content, meaning the ROI on SEO far exceeds other methods of digital acquisition. Locally-focused SEO will become a priority in the beginning of 2018. With high brand recognition and search volume around phrases including “cherry creek” in the Denver metro area, non-brand specific searches will become a priority for other branches. We are reaching out to branch manager to create local content for each branch page. This will include local references, outbound and inbound links, and more information on branch-level initiatives. We’re also looking to integrate neighborhood-specific data for each branch are to pull both geographic and non-geographic search terms. Branch SEO will be determined by severity. If a branch already ranks within the top 3 results, maintenance and standard SEO upkeep will be done. Branches ranking beyond the first page of results will get priority in SEO work. SEO focus is put on high volume and high relevancy keywords. For example, a search term for “mortgage loans in lafayette, colorado” may be an ideal term to rank for, but the average number of monthly searches for that terms are less than 5. On the other hand, the term “get a home loan” has an average of 500 searches a month and just the term “mortgage” averages over 60,000 searches a month. We put time, effort, and strategy behind high volume keywords to create a larger SEO footprint in more than one area and to stay on top of the highest volume searches in the US. Our second largest focus in 2018 is loan product pages and rankings. As more information is readily available, consumers are more fluent in the language of our industry. Instead of looking for just a loan, they know to search for FHA, HUD 184 or a VA benefit loan. With more granular searches like these, we see a significantly higher purchase intent in those users. We are creating, building and optimizing dozens of pages that will house content on specific loan products, programs and features. This will catch users farther in the purchase and decision cycle and help boost digital conversion rates. 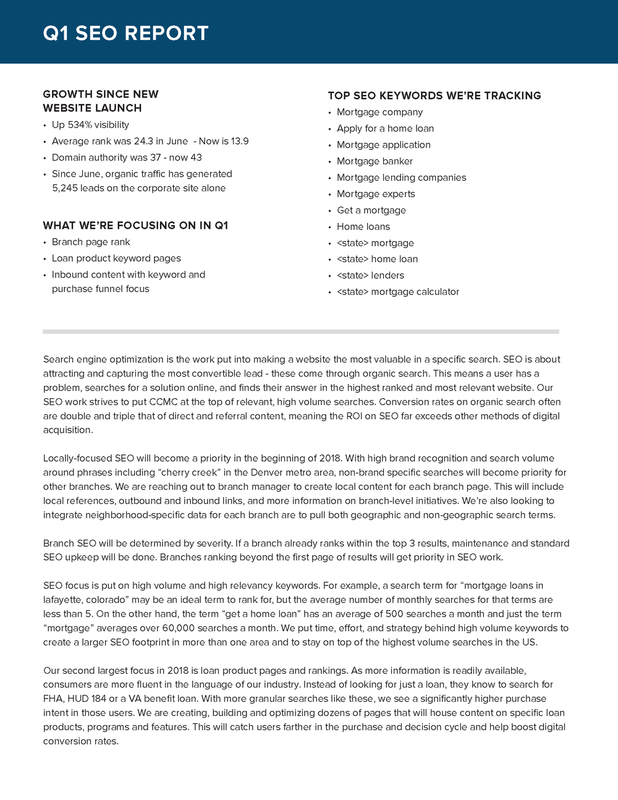 Here's a full report of the SEO work to date in 2017.